If you are unable to breastfeed your baby directly due to various reasons, it is important to express milk during times when your baby would normally feed. This will help you continue to make milk. 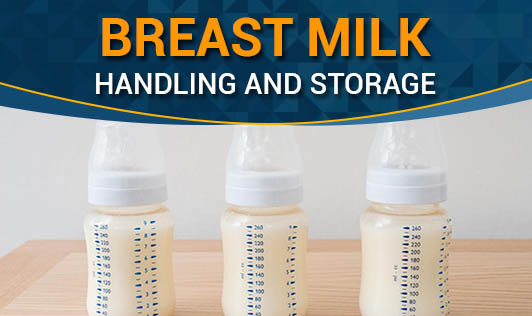 By following safe expression and storage techniques, nursing mothers and caretakers of breastfed infants, and children can maintain the high quality of expressed breast milk and the health of the baby. • Wash your hands well before expressing or handling breast milk as any contamination can affect the child. • Choose a clean, closed container to store the milk. Screw cap bottles, hard plastic cups with tight caps and well sealed containers can be used to store the milk. Avoid using ordinary plastic storage bags or formula bottle bags, as there could be a leak of milk from them. • If a child care provider has to handle the milk, clearly label the container with the child's name, time and date of expressing the milk. This will facilitate using the old milk first. • Do not mix fresh milk with frozen milk within the same container. • Do not save milk from a used bottle for use at another feeding time. • Countertop, table: If the milk is stored on the countertop or on a table, the temperature should be maintained at 77°F or 25°C and can be stored for a period of 6-8 hours. Cover the container with a cool towel to keep the temperature low. • Insulated cooler bag: The milk stored in this bag, should be maintained at 5-39°F or -15-4°C and can be stored for a period of 24 hours. This container should not be opened frequently and the ice packs need to be in contact with the milk containers at all times. • Refrigerator: the milk needs to be stored in the back of the main body of the refrigerator. It has to be maintained at a temperature of 39°F or 4°C and can be stored for a period of 5 days. • Freezers: When in the freezer, the milk has to be stored in the back of the compartment where temperatures are constant. The temperature needs to be maintained between 5°F or -15°C when stored in a freezer within the refrigerator compartment where it can be stored for 2 weeks or in a separate freezer compartment at the same temperature for a period of 3-6 months. How do you thaw breast milk? • Before using frozen breast milk, thaw it by transferring it to the refrigerator or place it in a bowl of warm water. • Avoid using a microwave oven to thaw or heat bottles of breast milk as microwaves can heat liquids unevenly, damage bottles or excess heat can destroy the nutrient quality of the expressed milk. • Do not re-freeze breast milk once it has been thawed. These are a few important precautions you need to take while expressing and storing breast milk.